Background and Objectives: Hyperglycemia in patients admitted for acute coronary syndrome (ACS) is associated with increased in-hospital mortality. We evaluated the relationship between admitting (nonfasting) blood glucose and in-hospital mortality in patients with and without diabetes mellitus (DM) presenting with ACS in Oman. Patients and Methods: Data were analyzed from 1551 consecutive patients admitted to 15 hospitals throughout Oman, with the final diagnosis of ACS during May 8, 2006 to June 6, 2006 and January 29, 2007 to June 29, 2007, as part of Gulf Registry of Acute Coronary Events. Admitting blood glucose was divided into four groups, namely, euglycemia (≤7 mmol/l), mild hyperglycemia (>7-<9 mmol/l), moderate hyperglycemia (≥9-<11 - mmol/l), and severe hyperglycemia (≥11 mmol/l). Results: Of all, 38% (n = 584) and 62% (n = 967) of the patients were documented with and without a history of DM, respectively. Nondiabetic patients with severe hyperglycemia were associated with significantly higher in-hospital mortality compared with those with euglycemia (13.1 vs 1.52%; P<0.001), mild hyperglycemia (13.1 vs 3.62%; P = 0.003), and even moderate hyperglycemia (13.1 vs 4.17%; P = 0.034). Even after multivariate adjustment, severe hyperglycemia was still associated with higher in-hospital mortality when compared with both euglycemia (odds ratio [OR], 6.3; P<0.001) and mild hyperglycemia (OR, 3.43; P = 0.011). No significant relationship was noted between admitting blood glucose and in-hospital mortality among diabetic ACS patients even after multivariable adjustment (all P values >0.05). Conclusion: Admission hyperglycemia is common in ACS patients from Oman and is associated with higher in-hospital mortality among those patients with previously unreported DM. The burden of DM in Gulf countries is highest among all nations (13-18% vs 6-7% global prevalence) and according to International Diabetic Federation, it will double by 2030. Prevalence of DM among ACS patients in Gulf countries is reported to be 40%. Although the prevalence of DM is increasing, DM remains undiagnosed in many patients. There is currently only a scant literature that has explored the relationship between admitting (nonfasting) blood glucose and in-hospital mortality in ACS patients with or without DM in developing countries like Oman or the Gulf region. Hence, we evaluated the association between admitting blood glucose and in-hospital mortality in ACS patients with and without DM in Oman. In this analysis, consecutive ACS patients from a prospective registry, Gulf RACE Registry of Acute Coronary Events (RACE), was used. Gulf RACE was a prospective, multinational, multicentre registry of consecutive patients above 18 years of age hospitalized with the final diagnosis of ACS (unstable angina, ST-elevation, and non-ST-elevation myocardial infarction) from various hospitals in six Middle Eastern countries. Patients presenting with ACS were stratified into the following two groups on the basis of their diabetic history: nondiabetic group and diabetic group. Diabetic group consisted of patients with a known history of type 1 or type 2 DM treated with diet, oral hypoglycemic agents, or insulin. Demographic and other baseline clinical characteristics of the patients along with in-hospital mortality were elicited. Blood for plasma glucose determinations was collected immediately after admission, and analyzed. Admitting blood glucose was divided into four groups, namely, euglycemia (≤7 mmol/l), mild hyperglycemia (>7-<9 mmol/l), moderate hyperglycemia (≥9-<11 mmol/l), and severe hyperglycemia (≥11 mmol/l). Institutional review board approval was obtained. The treatment for ACS and diabetes were at the discretion of the treating physician. For categorical variables, frequencies and percentages were reported. Differences between groups were analyzed using univariate logistic regression. For continuous variables, mean and standard deviation were reported and analyses were conducted using univariate linear regression. Multivariable adjustment was performed using logistic regression. The dependent variable, in both the nondiabetic and diabetic models, was in-hospital mortality. The main independent variable was blood glucose group, with euglycemia as the reference cohort. Other covariates in the two models included the significant variables in [Table 1] and [Table 2], respectively. The results of the logistic models are presented as odds ratio (OR) with the associated 95% confidence interval. The goodness-of-fit of the logistic models were examined using the Hosmer and Lemeshow goodness-of-fit statistic. This test analyses the actual vs the predicted response; theoretically, the observed and expected counts should be close. On the basis of the χ2 distribution, a Hosmer and Lemeshow statistic with a P value greater than 0.05 is considered a good fit. The discriminatory power of the logistic model was assessed by the area under the receiver operative characteristics (ROC) curve, also known as C-index. A model with perfect discriminative ability has a C-index of 1.0; an index of 0.5 provides no better discrimination than chance. Models with area under the ROC curve of greater than 0.7 were preferred. An a priori two-tailed level of significance was set at the 0.05 level. Statistical analyses were conducted using STATA version 11.0 (STATA Corporation, College Station, TX). A total of 1583 ACS subjects were recruited from hospitals throughout Oman. However, 32 subjects (2%) were excluded due to missing information. The remaining 1551 subjects represents the sample size for this study. Of all, 38% (n = 584) and 62% (n = 967) of the patients were documented with and without a history of DM, respectively. [Table 1] presents the demographic and clinical characteristics of the patients without DM. 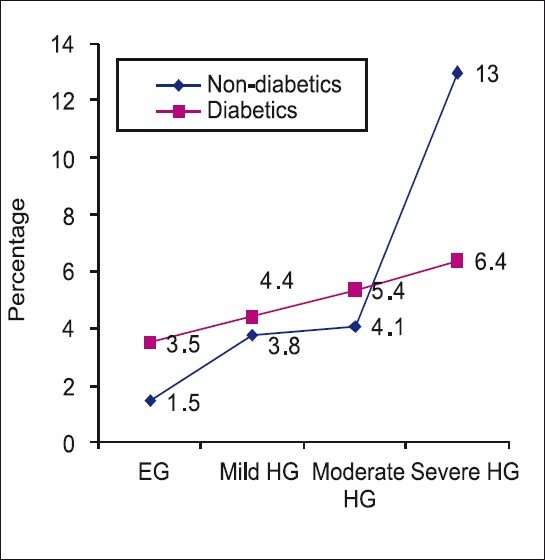 A substantial proportion (46%) of ACS patients with elevated admitting blood glucose along with 25% (n = 237) in the mild hyperglycemia group, 10% (n = 96) in the moderate hyperglycemia group, and 11% (n = 107) in the severe hyperglycemia group did not have previously recorded DM. The in-hospital mortality in the diabetic group was slightly, but not significantly, higher when compared with the in-hospital mortality of the nondiabetic cohort (5.65 vs 3.62%; P = 0.058). There was a near-linear relationship between admitting (nonfasting) blood glucose levels and in-hospital mortality. Higher admitting blood glucose levels were associated with higher in-hospital mortalities [Figure 1]. Those nondiabetic patients with severe hyperglycemia were associated with significantly higher in-hospital mortality compared with those with euglycemia (13.1 vs 1.52%; P<0.001), mild hyperglycemia (13.1 vs 3.62%; P = 0.003), and even moderate hyperglycemia (13.1 vs 4.17%; P = 0.034). Even after multivariable adjustment, higher admitting blood glucose levels were still associated with higher in-hospital mortality [Table 3]. Specifically, those with severe hyperglycemia were still more likely to be associated with higher in-hospital mortality compared to those with euglycemia (OR, 6.3; P<0.001) or mild hyperglycemia (OR, 3.43; P = 0.011). 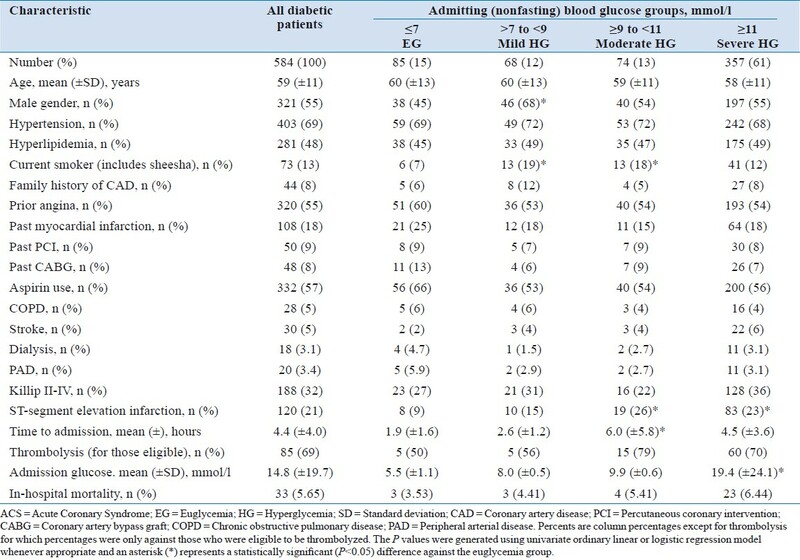 Only 15% (n = 85) had normal blood glucose levels at admission [Table 2]. Majority of the diabetics were not controlled, with 61% (n = 357) having severe hyperglycemia. There was also a slight near-linear relationship between admitting blood glucose levels and in-hospital mortality, though not as steep compared with those without a history of DM [Figure 1]. 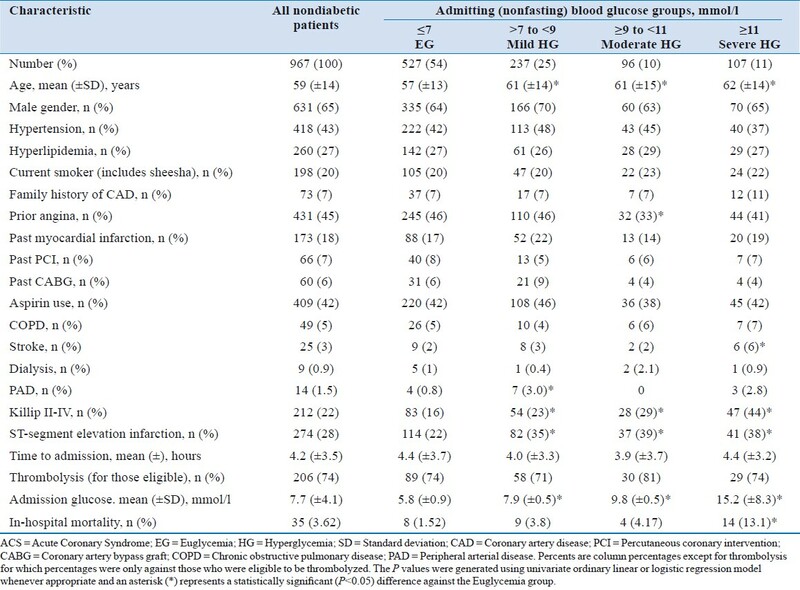 However, this relationship between admitting blood glucose levels and in-patient mortality was not significant [Table 1]. There were no significant differences in in-hospital mortalities between those with severe hyperglycemia and those with euglycemia (P = 0.312), mild hyperglycemia (P = 0.525), or those with moderate hyperglycemia (P = 0.738). The relationship between admitting blood glucose and in-hospital mortality was still not evident even after multivariable adjustment using logistic regression [Table 3]. The current study demonstrates that elevated admission glucose levels are associated with increased in-hospital mortality in nondiabetic ACS patients from Oman. This has been noted in other populations as well. ,,, The prevalence of new-onset hyperglycemia has varied widely from 3 to 71% depending on the definition used. In our study, 46% of the ACS patients with elevated admitting blood glucose did not have previously recorded DM. This number is dangerously high due to the fact that Middle East population already has high prevalence of DM ranging from 13 to 18%, when compared with global prevalence of 6 to 7%. Moreover, in a recent analysis of Gulf RACE from Oman, the prevalence of diabetes was reported to be 36%, along with 66% prevalence of metabolic syndrome. Furthermore, we demonstrated that the more severe the admitting hyperglycemia in nondiabetic patients, the higher the in-hospital mortality. These findings have been noted across the entire range of ACS, including unstable angina, ST-elevation and non-ST elevation myocardial infarction. Those nondiabetic patients with severe hyperglycemia were associated with significantly higher in-hospital mortality compared with those with euglycemia, mild hyperglycemia, and even moderate hyperglycemia, with near-linear relationship being noted between the admission glucose levels and in-hospital mortality. This near-linear relationship between admission blood glucose and in-hospital mortality was not evident in the diabetic group. This study included a large number of patients, but still the limitations of a registry-type study apply. Although multivariate adjustments were performed, unmeasured variables may exist that could not have been adjusted. The present analysis includes a subgroup of Gulf RACE patients in whom admission glucose levels were available; patients without available glucose levels may have differed substantially from those included in this analysis, although the number excluded was rather small (n = 32; 2%). Furthermore, the admission blood glucose may represent either random or fasting levels, which may have different outcomes. Finally, in few patients, admission glucose might be falsely elevated due to glucose-containing infusions, or falsely normal due to intravenous insulin administration. In conclusion, our results confirm that admission hyperglycemia is common in ACS patients from Oman and is associated with higher in-hospital mortality among nondiabetic patients. This group of patients requires specific care involving monitoring and pharmacological intervention. Furthermore, screening of patients in Gulf countries for possible undiagnosed DM may help decrease future risks. 1. Franklin K, Goldberg RJ, Spencer F, Klein W, Budaj A, Brieger D, et al. Implication of diabetes in patients with acute coronary syndromes: the Global Registry of Acute Coronary Events. Arch Intern Med 2004;164:1457-63. 2. Donahoe SM, Stewart GC, McCabe CH, Mohanavelu S, Murphy SA, Cannon CP, et al. Diabetes and mortality following acute coronary syndromes. JAMA 2007;298:765-75. 3. Foo K, Cooper J, Deaner A, Knight C, Suliman A, Ranjadayalan K, et al. A single serum glucose measurement predicts adverse outcomes across the whole range of acute coronary syndromes. Heart 2003;89:512-6. 4. Gale CP, Kashinath C, Brooksby P. The association between hyperglycemia and elevated troponin levels on mortality in acute coronary syndromes. Diab Vasc Dis Res 2006;3:80-3. 5. Goyal A, Mahaffey KW, Garg J, Nicolau JC, Hochman JS, Weaver WD, et al. Prognostic significance of the change in glucose level in the first 24 h after acute myocardial infarction: results from the CARDINAL study. Eur Heart J 2006;27:1289-97. 6. Stranders I, Diamant M, van Gelder RE, Spruijt HJ, Twisk JW, Heine RJ, et al. Admission blood glucose level as risk indicator of death after myocardial infarction in patients with and without diabetes mellitus. Arch Intern Med 2004;164:982-98. 7. Capes SE, Hunt D, Malmberg K, Gerstein HC. Stress hyperglycaemia and increased risk of death after myocardial infarction in patients with and without diabetes: a systematic overview. Lancet 2000;355:773-8. 8. Wahab NN, Cowden EA, Pearce NJ, Gardner MJ, Merry H, Cox JL. ICONS Investigators. Is blood glucose an independent predictor of mortality in acute myocardial infarction in the thrombolytic era? J Am Coll Cardiol 2002;40:1748-54. 9. Hadjadj S, Coisne D, Mauco G, Ragot S, Duengler F, Sosner P, et al. Prognostic value of admission plasma glucose and HbA in acute myocardial infarction. Diabet Med 2004;21:305-10. 10. Kosiborod M, Rathore SS, Inzucchi SE, Masoudi FA, Wang Y, Havranek EP, et al. Admission glucose and mortality in elderly patients hospitalized with acute myocardial infarction: implications for patients with and without recognized diabetes. Circulation 2005;111:3078-86. 11. IDF Diabetes Atlas, fourth edition, 2009. Available at: http://www.diabetesatlas.org/content/diabetes-and-impaired-glucose-tolerance . [Accessed on 2010 March 29]. 12. Zubaid M, Rashed WA, Almahmeed W, Al-Lawati J, Sulaiman K, Al-Motarreb A, et al. Management and outcomes of Middle Eastern patients admitted with acute coronary syndromes in the Gulf Registry of Acute Coronary Events (Gulf RACE). Acta Cardiol 2009;64:439-46. 13. Lemeshow S, Hosmer DWJ. A review of goodness of fit statistics for use in the development of logistic regression models. Am J Epidemiol 1982;115:92-106. 14. Hanley JA, McNeil BJ. The meaning and use of the area under a receiver operating characteristic (ROC) curve. Radiology 1982;143:29-36. 15. Monteiro S, Monteiro P, Gonçalves F, Freitas M, Providência LA. Hyperglycaemia at admission in acute coronary syndrome patients: prognostic value in diabetics and non-diabetics. Eur J Cardiovasc Prev Rehabil 2010;17:155-9. 16. Angeli F, Verdecchia P, Karthikeyan G, Mazzotta G, Del Pinto M, Repaci S, et al. New-onset hyperglycemia and acute coronary syndrome: a systematic overview and meta-analysis. Curr Diabetes Rev 2010;6:102-10. 17. Ishihara M, Kojima S, Sakamoto T, Kimura K, Kosuge M, Asada Y, et al. Japanese Acute Coronary Syndrome Study (JACSS) Investigators. Comparison of blood glucose values on admission for acute myocardial infarction in patients with versus without diabetes mellitus. Am J Cardiol 2009;104:769-74. 18. Kosiborod M, Inzucchi SE, Krumholz HM, Xiao L, Jones PG, Fiske S, et al. Glucometrics in patients hospitalized with acute myocardial infarction: defining the optimal outcomes-based measure of risk. Circulation 2008;117:1018-27. 19. Panduranga P, Sulaiman KJ, Al-Zakwani IS, Al-Lawati JA. Characteristics, management and in-hospital outcomes of diabetic acute coronary syndrome patients in Oman. Saudi Medical Journal 2010;31:520-524. 20. Okosieme OE, Peter R, Usman M, Bolusani H, Suruliram P, George L, et al. Can admission and fasting glucose reliably identify undiagnosed diabetes in patients with acute coronary syndrome? Diabetes Care 2008;31:1955-9. 21. Norhammar A, Tenerz A, Nilsson G, Hamsten A, Efendíc S, Rydén L, et al. Glucose metabolism in patients with acute myocardial infarction and no previous diagnosis of diabetes mellitus: a prospective study. Lancet 2002;359:2140-4. 22. Wallander M, Bartnik M, Efendic S, Hamster A, Malmberg K, Öhrvik J, et al. Beta cell dysfunction in patients with acute myocardial infarction but without previously known type 2 diabetes: a report from the GAMI study. Diabetologia 2005;48:2229-35. 23. Ceriello A. Acute hyperglycaemia: a "new" risk factor during myocardial infarction. Eur Heart J 2005;26:328-31. 24. Vaidyula VR, Boden G, Rao AK. Platelet and monocyte activation by hyperglycemia and hyperinsulinemia in healthy individuals. Platelets 2006;17:577-85. 25. Undas A, Szuldrzynski K, Stepien E, Zalewski J, Godlewski J, Pasowicz M, et al. Reduced clot permeability and susceptibility to lysis in patients with acute coronary syndrome: effects of inflammation and oxidative stress. Atherosclerosis 2007;196:551-7. 26. Undas A, Wiek I, Stêpien E, Zmudka K, Tracz W. Hyperglycemia is associated with enhanced thrombin formation, platelet activation, and fibrin clot resistance to lysis in patients with acute coronary syndrome. Diabetes Care 2008;31:1590-5. 27. Esposito K, Nappo F, Marfella R, Giugliano G, Giugliano F, Ciotola M, et al. Inflammatory cytokine concentrations are acutely increased by hyperglycemia in humans: role of oxidative stress. Circulation 2002;106:2067-72. 28. Weston C, Walker L, Birkhead J. National Audit of Myocardial Infarction Project, National Institute for Clinical Outcomes Research. Early impact of insulin treatment on mortality for hyperglycaemic patients without known diabetes who present with an acute coronary syndrome. Heart 2007;93:1542-6. 29. Deedwania P, Kosiborod M, Barrett E, Ceriello A, Isley W, Mazzone T, et al. Hyperglycemia and acute coronary syndrome. A scientific statement from the American Heart Association Diabetes Committee of the Council on Nutrition, Physical Activity, and Metabolism. Circulation 2008;117:1610-9.